Domestic cats, Felis silvestris catus, may have appeared in our history longer ago than we thought, but it is still the most recently domesticated mammal. Research shows that it is the least altered of our domestic pets, both anatomically and behaviorally. It was estimated that the cat joined our path in history around 1500 BC, but a find in a cave in Cyprus may have changed all that - a cat was found buried next to a human there already some 9500 years ago. It may be that the cat was domesticated in the Near East, in the Fertile Crescent area when agriculture developed. At about 1500 BC the cat seems to have been be tamed in Egypt, no doubt first having appeared because of the plentiful catch of rodents that were around in an agrarian culture. The Egyptians certainly would have welcomed an animal that protected their granaries. They also had a keen eye for beauty, which might also have been an aspect in accepting these wild creatures around. Ever practical, the Egyptians called the cat “miu” which meant “she who mews”. The brother of the famous pharaoh Akhenaten, the crown prince Tuthmosis, who died before ascending to the throne, buried his pet cat in a stone sarcophagus. 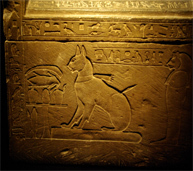 The cat in question was called Ta-Miu (she-cat), and this sarcophagus, now in the Cairo Museum, is a touching proof of the affection Tuthmosis felt for his cat. The cat was revered as a goddess, Bastet (or Bast), in Egypt. Thousands of cat mummies have been found. Herodotos, the Greek historian from the 5th Century BC, travelled Egypt and in his “Account of Egypt” tells that the Egyptians so loved their cats that if a house cat died, they shaved their eyebrows as a sign of mourning. However, if you read the whole book, you see the most amazing stories written there that have no roots in reality – it may have been that the Egyptians were pulling his leg a bit and telling him many things that were not true – so you can’t be really sure if the eyebrow-shaving ever happened. Still, it might have! From Egypt the domestic cats spread to Greece and to Rome. It is estimated that the Romans brought the cat to Britain by 300 AD. There is a law from 936 AD in Britain to protect the cats – obviously their role in destroying the vermin was considered to be very important. Still, until 1000 AD the cat was rare in Europe. Unfortunately, during the age of the witch hunts the cat was considered to be in liaison with the devil, and vast numbers of cats were killed as a result. How this affected the spreading of the plague which was carried by the fleas in black rats, is anybody’s guess. Still, the farming communities understood the importance of the cat. When man’s existence was dependent on a successful crop and keeping that crop well protected from harm, a cat had an important role in the agrarian economy. 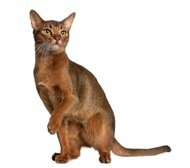 In time the cat breeds diversified – first by natural development, then by human intervention, and what we know today as domestic cat breeds appeared. We could roughly say there are two types of domestic cats: domestic long hair cat and domestic short hair cat. The short-haired cats are usually from medium to large in size. Their fur is short and dense, fine but not woolly. Their tail is well proportioned and slightly thicker at the base. Their legs are of medium length and their chest is broad. The cheeks are rounded, the eyes large and round, far apart. The muzzle is square in shape. 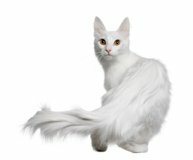 The long-haired cats are usually medium or large in size and their bodies are more massive and well rounded. Their paws are thicker, strong and straight. They have large, round heads with full cheeks. They have big eyes, set far apart, in brilliant colors. Their ears are far apart with long tufts of hair and their noses are short and snubbed. Their tails are short and straight, carried low, full in appearance. Their coat is long and flowing and they have a mane-like ruff around their heads which continues down between their front legs like a frill. They have tufts of long hair between their toes as well. The domestic cats are usually around 8 inches /20 cm high (but there are much taller and smaller breeds as well). Their average length from the tip of their nose to the tip of their tail is around 20 inches / 50 cm. Their average weight varies between 5,5 to 16 pounds / 2,5 to 7 kg. The eyes of domestic cats are large, looking forward. The vision field is lot like humans (as compared to animals that have eyes on the side of the head). Cats see well in dim light and perceive movement easily, which increases their efficiency as hunters, even if their ability to see colors is not as developed as that of humans. Sensitive whiskers help them analyze their environment and acute sense of hearing (especially high-pitched sounds) and the ability to move their ears independently of the other to pinpoint the source of a sound helps them in their hunting. Their feet are padded, which allows them to stalk their prey silently. And when they attack their prey, their sharp claws make sure it doesn’t escape. The cat’s sense of smell is way stronger than us humans – 14 times more acute, with twice as many smell sensitive cells than in a human nose. Domestic cats are meat-eaters, they have the simple short gut of carnivores and have trouble digesting plants. They eat some grass to aid their digestive systems – it prevents hairballs. Their tongues are also rough with hooked papillae on its surface– this helps them to enjoy every bit of meat from the bones and also clean themselves more efficiently. They have sharp teeth. On short distances they are faster than other mammals (30 miles/h or 48 km/h) and they are amazing jumpers (they can jump over a wall of 7 feet from standing paws). The cats also communicate with their voice – they miaow, they purr, they hiss (which is actually blowing air out of the mouth), and some cats almost chirp. A common misconception is that the cat is a loner. This is not so – in the wild the cats often forms groups, communities of sorts and enjoy each others’ company. Still, when they hunt, they hunt alone. The cat usually lives over 10 years – the oldest known cat was 36 years old when it died. Domestic cats of course live longer, as they are mostly indoors, away from the dangers of the outdoors. In nature cats spare their energy by sleeping a lot – more than most animals. Everyone has seen films and pictures of lions sleeping most of the daylight hours, and their smaller cousin, the domestic cat, does the same: it sleeps on average 14 hours per day. Older cats tend to nap even longer. A cat likes to keep itself clean – probably to keep themselves as odorless as possible so its prey won’t notice it hunting. The cats breed rapidly - and so unneutered cats in the neighborhood can produce several litters in a year. Often in climates that don’t naturally support cats this may lead to suffering. There are uncounted millions of feral cats in this world. When cats are brought to ecosystems they don’t belong to, they can cause havoc amongst the original animal species that have not adapted in their evolution to this efficient hunter. 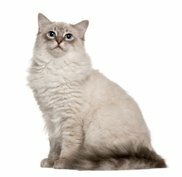 There are endless variations of cat colors: solid colors, striped and tabby colors, red, white, black, grey or blue, colorpoint… Their eye colors vary from bright blue to deep copper and green. All this adds to their charm. And these lovely tame hunters share our lives, surprising us every now and again with their wilder side. But that is a part of the popularity of the domestic cats. They are never dull but enrich our lives with their catness! 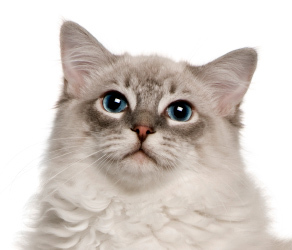 Photograph copyright holder: Abyssinian, Ragdoll, Turkish Angora by GlobalP / IstockPhoto. Do not copy.